View the best resources around the web and in Las Vegas to help you plan the perfect wedding. All the Las Vegas wedding planning information you could want right here, just a click away. 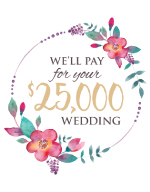 $25,000 Big Wedding Giveaway. One lucky couple is going to win an amazing wedding. You choose the location and the wedding professionals who will be a part of the day. We'll pay for everything up to $25,000! Register on BridalSpectacular.com Visit Bigweddinggiveaway.com for details and complete contest rules. Las Vegas brides most requested wedding planner. The pefect size for you to carry with you and everything you need to plan your wedding. Visit our website to request your FREE Spectacular Wedding Planner!